The Vatican tribunal has found Archbishop Anthony Sablan Apuron, guilty of “certain of the accusations” against him. He was was accused of sexual abuse. Now he has been removed from office. A five-judge panel of the Congregation for the Doctrine of the Faith (CDF) announced the verdict on Friday. He now endures “the penalties of privation of office and prohibition of residence in the Archdiocese of Guam,” but promises to appeal. Archbishop Apuron was appointed leader of the Archdiocese of Agaña in 1986. In 2016, Pope Francis placed him on a leave due to accusations from young men. 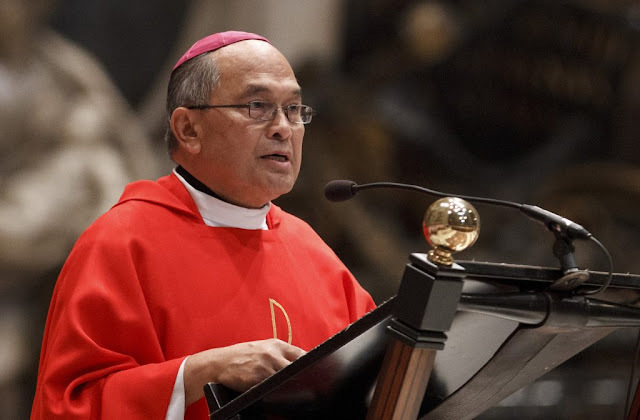 The canonical trial in the matter of accusations, including accusations of sexual abuse of minors, brought against the Most Reverend Anthony Sablan APURON, O.F.M.Cap., Archbishop of Agaña, Guam, has been concluded. The Apostolic Tribunal of the Congregation for the Doctrine of the Faith, composed of five judges, has issued its sentence of first instance, finding the accused guilty of certain of the accusations and imposing upon the accused the penalties of privation of office and prohibition of residence in the Archdiocese of Guam. The sentence remains subject to possible appeal. In the absence of an appeal, the sentence becomes final and effective. In the case of an appeal, the imposed penalties are suspended until final resolution.